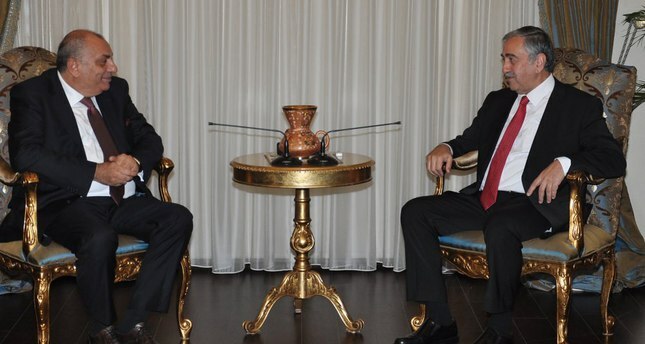 President of the Turkish Republic of Northern Cyprus Mustafa Akıncı (R) and Tuğrul Türkeş. Independent parliamentarian and Deputy Prime Minister Tuğrul Türkeş, who has recently parted ways with the Nationalist Movement Party (MHP) that was founded by his late father Alparslan Türkeş, criticized both the MHP and Republican People's Party (CHP) leaders for their unwillingness to compromise during the failed negotiations that led Turkey to call snap elections for Nov. 1. Speaking to Daily Sabah during his visit to the Turkish Republic of Northern Cyprus on Tuesday, Türkeş said MHP leaders opposed to forming a coalition with any party, refused to support a minority or caretaker government and also refused to give members to the interim Cabinet. "The reason behind the failed talks is the CHP and MHP's attitude," said Türkeş, who has recently joined the Justice and Development Party (AK Party) to run for parliamentary snap elections in Ankara. He also commented on Bahçeli's record of dismissing popular MHP figures from the party, including former deputy Sinan Oğan and former deputy Parliament Speaker Meral Akşener, both of whom were highly supported by the party members and seen as possible successors of Bahçeli. Visiting his father's hometown in northern Cyprus, Türkeş met with Turkish Cypriot President Mustafa Akıncı, Prime Minister Ömer Kalyoncu, Parliament Speaker Sibel Siber, Turkish Cypriot Peace Command Chief Gen. İlyas Bozkurt and various political party leaders. When asked about Bahçeli's publicly criticizing him, Türkeş said he will no longer reply to "worthless" remarks of his former party and its leader, who referred Türkeş to the party's disciplinary board after he accepted the interim government's offer to take a ministerial role in the Cabinet. "Mr. Chairman got too low," he said. Türkeş's opinion about Akşaner, though, is quite different, as he believes she is one of the only politicians highly respected by all parties. Türkeş said, "Mrs. Akşener is a respected person and she successfully served as deputy parliament speaker for eight years. He [Bahçeli] could invite her to his office and tell his decision to not include Akşener in his list. This is what statesmanship requires one to do. All other parties either went to the ballots or held deep studies to determine their candidates. But with the MHP, it was the party board that created the candidate list. The MHP is becoming a single-man-ruled party." Stating that his conflict is not with the MHP supporters but the party leadership, Türkeş said the nationalist circles supported his decision to resign and join the AK Party. When asked about CHP leader Kemal Kılıçdaroğlu commenting on his resignation as a "disappointment," Türkeş said he is happy to hear such a comment from Kılıçdaroğlu. "I have no desire to make the CHP happy with my moves. So, I see that I am walking on the right path," he added. Türkeş thanked the AK Party administration and its voters for embracing him and said Turkey lost three months with the coalition dilemma. Türkeş and Bahçeli were once rivals in MHP's heated party congress held in 1997 after the death of the party founder. Bahçeli surprisingly won the tight race, and Türkeş left the party, only to return in 2007. Türkeş's younger son, Ahmet Kutalmış Türkeş, served as an AK Party deputy between 2011 and 2015, and resigned from the party shortly before the June 7 elections. The MHP has been under fire for its uncompromising attitude since the June 7 elections. The party's stance has created dissent within the MHP. Sinan Oğan, a former deputy, was expelled from the party for saying that the party performed poorly in the June 7 elections and could fail to pass the 10 percent election threshold in the upcoming Nov. 1 elections. Earlier on Sept. 5, the MHP's central disciplinary committee said it had expelled Türkeş after he accepted an offer to join the country's caretaker Cabinet in defiance of his party's instructions to do otherwise. Türkeş was the first Turkish parliamentarian to accept Prime Minister Ahmet Davutoğlu's invitation to join the interim government. He was given the deputy prime minister's post in the interim Cabinet formed on Aug. 28 in the run-up to the Nov. 1 election. The provisional government, which will steer Turkey to a rerun of June's general election on Nov. 1, includes representatives from the AK Party, Türkeş and two deputies from the pro-Kurdish Peoples' Democratic Party (HDP). However, both of the HDP ministers resigned from their ministerial positions on Tuesday. The Republican People's Party (CHP) – the second largest in Turkey's Parliament – refused to join the interim Cabinet. The June 7 general election saw a stalemate with no party winning the majority necessary to form a single party government.